Drizzly view of the City Centre from the UMIST building, Whitworth St.
UMIST is host to many foreign students here to do further degrees and learn English. Today's national news was dominated by the successful emergency landing at Manchester Airport last night of a crippled Advanced Turbo Prop (ATP) aircraft. Shortly after flight BA 7725 took off at 5.00 pm for Knock, Republic of Ireland, the crew noticed a problem with the undercarriage. They spent three hours circling above the North West, using up fuel, before returning to Manchester Airport. Watched by Airport staff and spectators, Captain John Jones, 40, of Glossop, skilfully brought the plane to the ground, nosewheel first, then the right hand wheel, and finally, with a shower of sparks, the left hand engine pod touched the runway, which had been covered with foam. All passengers and crew got off safely via the escape chutes. A Boeing 757 of the Manchester-based Air 2000 moves onto the runway just after another plane has landed. To the left, in the old BA colours, is an ATP similar to the one involved in yesterday's incident. The stricken aircraft took off shortly before this photo was taken. Nearly 1.7m people passed through Manchester Airport in July, and during one hour on the morning of Friday the 25th, a record 50 planes took off or landed. Many of the people on board were travelling to the religious shrine of Knock, and quite a few Hail Mary's were recited as the aircraft made its emergency landing. There was universal praise for Captain Jones, who says he's not a hero and is only doing his job. The passengers arrived safely at their destination in the west of Ireland this evening. An enquiry into the incident began this morning. I was at the southern end of the airport on the R2 site (more below) as the drama, unbeknown to me, was unfolding, but I had left by the time the aircraft landed. Better luck next time! Otherwise, both weather and news stories have been mixed and somewhat unpredictable this week. One report which reached the national media was the disappearance of Jim Shaw, the coach driver involved in the recent bus crash in which three young people were killed. On Tuesday, he had apparently disappeared but the next day he was reported to be safe and well. On Thursday, the police announced that important new details about the Jamie Lavis case had come to light, and they repeated their request for people to come forward with information. The search was reported to be concentrating on the Reddish area of Stockport. Parents of boys attending St Bedes College protested at Trafford Borough Town Hall, Sale, on Tuesday because of a decision to withdraw grants from Trafford Borough Council enabling Catholic pupils to attend the £4000 a year independent college. Councillors have said that in future, all Catholic children funded by the state system will have to go to Catholic secondary schools within Trafford Borough. Trafford, comprising Stretford, Sale, Urmston, Altrincham, Bowdon and Hale, is one of the few boroughs in the country still to operate a two-tier secondary school system, with grammar schools and high schools. Due to a shortage of places, Trafford has paid for Catholic children who have passed the 11+ to go to St Bedes. The future of Manchester's most famous night club, the Hacienda, is in doubt. The club closed recently with debts of half a million pounds. It had earlier experienced problems with drugs, and had been shut down by the Greater Manchester Police. The Police are said to be reluctant to grant the venue a licence, making it an unattractive proposition for any future owners. It may be converted instead into offices, apartments or a restaurant. Although Manchester has a huge selection of night clubs, several of which stay open until 6am, it would be a pity if it went the same way as the Manchester Ice Palace and Belle Vue Showgrounds. The Hacienda is much sought after by youthful visitors to Manchester, many of whom come here as tourists and to study. Groups of youngsters here on summer English courses are frequently to be seen around the city centre with tour guides and tutors. Despite adverse descriptions in books such as the Lonely Planet Guide, lots of summer backpackers come to Manchester to see for themselves what it has to offer. Along with all the vibrant night life, shops, shows, art galleries, museums and beautiful buildings, the Victoria Fountain, opened last week, is proving to be quite a hit. 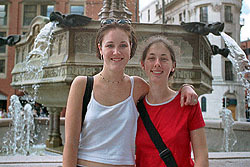 Tourists of all nationalities can be seen having their photographs taken in front of it, including (left) Erin Hargadon and Rosalind Hunter, both from Ottawa, Canada. As the start date for the first non-stop Manchester to Paris train service gets closer and closer, regional company North West Trains have announced an order for a new fleet of trains capable of 125 mph. There will be innovations such as a direct service to London from Oldham, and a London to Manchester Airport service. Many Manchester commuters still have to travel on rolling stock more suited to a museum, including the old "slam door" electric unit trains, still used on the run-down Hadfield/Glossop line. Still, there are more and more newer trains operating on lines round the region, and with coming extension of the Metrolink system to Salford Quays, Eccles, Ashton and Didsbury, the city should finish up with a very impressive transport system. Work on Manchester Airport's second runway is proceeding, as I witnessed yesterday on a walk around the area, devoid of workmen as it was a Sunday. Grassy banks along the A538 on the R2 site have already been levelled, and evidence of impending work, such as wire fences, diggers, contractors jeeps and portaloos, is everywhere to be seen. The aviation viewing park is now closed, as is the road to Styal. I drove through the tunnel to the other side of the old runway, parked near Castle Hill, and walked along part of the Bollin Valley Way, a public footpath leading across fields and past the bottom end of the airfield. I stood next to the landing lights and watched screaming jets and smaller aircraft on their final approach, seemingly only a few feet above me. Though I had a legal right to be there, I felt like Mulder on a field trip, or perhaps living out an episode of "Thunderbirds". The planes normally approach from the other end, but today there was a north easterly wind. The footpath continues into the "condemned zone" beyond. A sign informs walkers that the way is still open. On either side are tall fences, behind which some security guards sat near an abandoned farmhouse (left). A bit further on, a house, standing behind one of the "Iron Curtain" style security fences, still showed signs of habitation, including washing on the line. Ponds have been surrounded in protective plastic sheeting, barbed wire fences extend across the fields. A few hundred yards later, the path leads out of the R2 site and back onto open farmland. I turned round and walked back along the path through the "zone" thinking this may well be the last time I'll see it like this. Local events this weekend have included the Manchester Garden show, which took place yesterday at Platt Fields, as well as the Bauer In-Line skating festival at the Manchester Velodrome. 50 years ago this weekend, the Royal Lancashire Show took place on 45 acres in Salford. 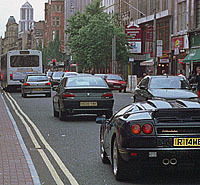 There was a rush out of the city for the bank holiday weekend, read about it in Manchester Eyewitness. The 1997 Royal Lancashire show was held last week in Chorley, which unlike Salford, is still under the jurisdiction of Lancashire County Council. Like the county border, the bank holiday has, in the intervening years, been been moved as well: it's on Monday, August the 25th. The annual car-buying rush culminated as ever on August the first, and I've seen quite a few R-registered vehicles around the city, including this racy-looking number on Deansgate. Sunshine earlier in the week yielded to rain, sometimes heavy, mostly falling as a fine drizzle. The overcast conditions caused the temperature to drop, though not much below the 70 degree mark. By the weekend, the rain cleared up, but the sunny weekend predicted by forecasters never happened. This morning Mancunians woke up to bright sunshine, but by the end of the day, it was overcast again. Later in the week, temperatures are set to climb into the high 70's, with the possibility of thunderstorms.